“No Escape” stars Owen Wilson as a man who has taken a job with a multinational conglomerate in Southeast Asia after his own business went belly up. 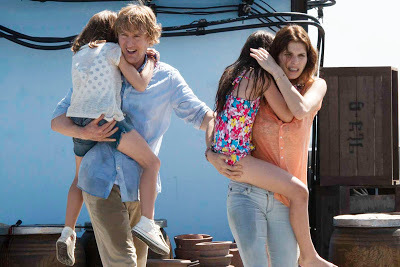 Wilson and wife Lake Bell and their two young daughters aren’t sure what to expect as they move halfway around the world, but things go badly very quickly. After settling into their hotel, Wilson goes out to find an English-language newspaper in the neighborhood. Before long, he finds himself in the midst of a violent skirmish between a large group of angry men and the local police. He has no idea what’s going on, but as he works his way back to the hotel, he sees the protest group beating and killing pretty much every Caucasian they come across. When he gets back to the hotel, things are even worse, with more of the rebels — or whoever they are — going from room to room, knocking down doors, and murdering everyone in their path. Wilson manages to get back to his wife and daughter, and now they’re all on the run together. They get to the roof, where several dozen other non-Asian guests are huddled in fear with nothing more than a locked door between them and the roving band of thugs. With nowhere else to go, Wilson convinces Bell that they have to get to the rooftop of a shorter building across the street — which means a big jump that’s difficult enough for adults, but much harder for young girls. This sequence was so harrowing that my wife couldn’t take it anymore — rather than rip my arm off, she simply got up and left the theater. I won’t tell you any more about the plot other than it’s a nonstop chase as Wilson, who discovers he’s being personally targeted by the rebels, desperately tries to get the family to safety. They get some assistance from Pierce Brosnan as a British tourist/businessman who has some special knowledge of the situation they find themselves in. Brosnan’s character is similar in tone to the one he played in “The Matador,” an underrated 2006 movie in which he played a hitman with issues (listen to my interview with director Richard Shepard here). When I heard that this action drama starred Owen Wilson, I had my doubts he could pull it off, but he is surprisingly strong as the lead. Lake Bell (whose movie “In A World” I raved about in 2013) is very solid as the wife, as are the two young girls who play the daughters. “No Escape” was directed by John Erick Dowdle, who knows how to create suspense and keep the audience riveted. My only complaint regards one exposition scene in which Brosnan explains to Wilson the reason for the mayhem unfolding around them. It isn’t necessary — the audience is better off not knowing anything more than the lead characters, so we get entirely caught up in (and empathize with) their worsening situation. It is an intense experience, especially for anyone who has traveled abroad with small children, but a thrilling adventure that left me exhausted.